Jersey Mike's is one of those storied sandwich shops that became successful enough to spawn franchised versions all over the place. It is, in fact, from New Jersey, even if this version of the Italian sub might be a little more watered down than what you what get from the original location. Who knows? Who cares? It's pretty damn good, stacked with ham, prosciuttini, cappacuolo, salami and pepperoni, provolone cheese and veggie toppings "Mike's Way," which means onions, shredded lettuce, tomatoes, olive oil, red wine vinegar and oregano. 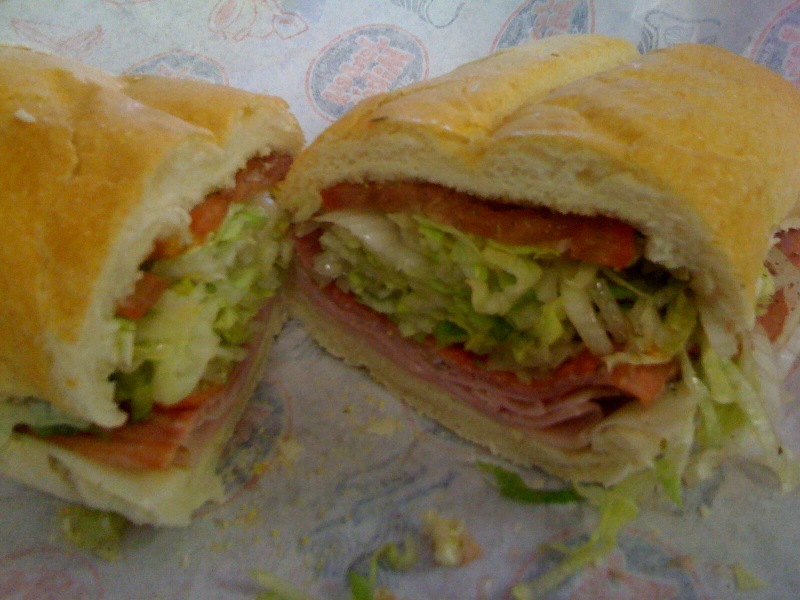 Compared to Italian sandwiches from other franchise shops, this sucker has way more meat. Spicier capacola would have been nice, but you can take the extra step and add some peppers if you need a bit of heat. The bread is a little too crusty and a little too dense to absorb the wonderful oil and vinegar seasonings, yet this is still a very juicy sandwich. They get pretty happy with vinegar, and there's nothing wrong with that. I guess that's Jersey style?